Home > Competitions and Giveaways > WIN a Messermeister Oliva Elite Knives ! WIN a Messermeister Oliva Elite Knives ! Taste is giving you the opportunity to WIN a Messermeister Oliva Elite Knives. To get in the draw, click the picture, enter your details, and submit your entry form. 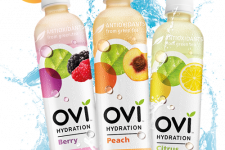 FREE OVI Hydratation Pack Up For Grabs! Win 1 of 10 Play-Doh Disney Princess Magical Designs Palace !